Funding recipients (l-r) Martin Connolly, Cathal McCauley, Max Beer, and Michael Lynch with Cllr McGinley. Nearly £30,000 seized from dealers and criminals will help fund the production of a new suicide prevention film that will be produced at the Londonderry Playhouse. 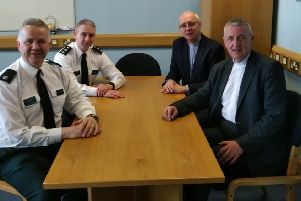 The funding is among £45,000 in total that has been newly secured from the Department of Justice from the Derry and Strabane Policing and Community Safety Partnership (PCSP). The sum of £29,830 was secured by the PCSP from the Assets Recovery Community Scheme (ARCS,) with awards made to the Playhouse to deliver the safeTALK film and to Men’s Action Network to deliver their Breaking the Cycle Initiative. safeTALK stands for ‘Suicide Alertness For Everyone: Tell, Ask, Listen and Keep-safe’ and is aimed at training local people and community workers to be able to identify suicidal ideation and teach them how best to help people with such thoughts. An additional £14,640 was awarded to the Shantallow Community Residents’ Association under Priority Youth Interventions to deliver a Prevention and Intervention Programme. PCSP Chair Councillor Eric McGinley, has welcomed the provision of the additional financial support. He said: “I am delighted that the Derry and Strabane PCSP was able to secure an additional £44,470 to support a number of local community safety initiatives. “With external funding support becoming increasingly difficult to source it is pleasing that local initiatives will benefit from this additional money secured through the PCSP. The funding received will support the delivery of three very unique and innovative initiatives that will enhance the community safety of our city and district. If you or someone you know are in crisis or despair contact Lifeline on 0808 808 800. Or contact the Samaritans on 028 71265511 (local call charges apply) or 116 123 (this number is free to call).